When you’re called to plan a morning meeting, pronto, that puts a lot of pressure on you to find catering. If you don’t have hours to plan a menu to wow your colleagues or clients, don’t worry. We’ve got tons of breakfast ideas, from small bites to complete meals. Check out these 50 ideas to inspire your next breakfast catering menu for the office. A warm roll layered with fluffy eggs and melty cheese. Try it with bacon or sausage, or avocado and tangy-sweet tomatoes, for off-the-charts flavor. We love breakfast sandwiches because they’re portable, filling, and customizable for different diets. Switch up your routine with a tray of assorted Cantonese staples, like juicy dumplings, barbecued pork buns, and smooth rice noodle wraps doused in sweet, seasoned soy sauce. Coffee and house-baked scones look mighty good at team and client meetings. Eggs, folded around ingredients like caramelized mushrooms, provide a tasty hit of protein. Does your team love fried chicken? Try having it for breakfast. Crisp-edged waffles are topped with fried chicken and drizzled with maple syrup. Feeding picky eaters? Customizable breakfast bowls can be adorned with toppings like sautéed kale and tofu—or prosciutto ham and poached eggs—to satisfy their cravings. 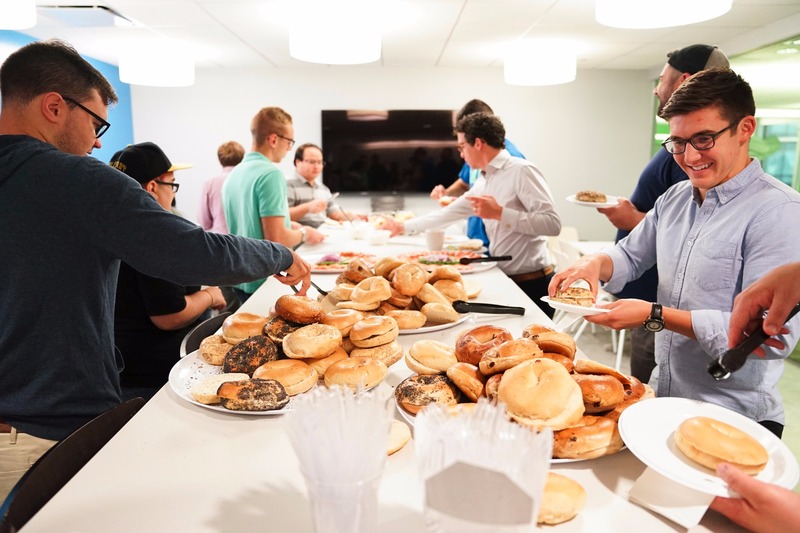 Ordering bagels for the office is one of our favorite breakfast menu ideas for saving time. It makes setting up easy. Once the food is ready, people can help themselves to creamy spreads. A box of tricked-out doughnuts practically announces a fun morning. Savory Brazilian pastries like deep-fried coxinhas and stuffed beef croquettes take breakfast to the next level. Usually around $3 each, these pastries can help you stick to the budget. Find these pastries near you. Not many breakfast menu ideas involve mouthwatering cake—but your office probably won’t mind. Part coffee cake, part brioche bread, babka is braided with a lavish mix of chocolate and cinnamon streusel. A breakfast social of waffles can do wonders for morale. Don’t be shy about adding wavy bacon and eggs to the mix. Pancakes can be customized however you want so that just about everyone in your group can enjoy them—even those on a gluten-free diet. This is an old breakfast standby for a reason. Go big with these fun waffle-doughnut hybrids, glazed and coated with crushed cookies and nuts. Sides of home fries and sticky buns fill out this Southern meal—perfect for a special company gathering. We love yogurt and chia-seed pudding any time of day. For a light but satisfying breakfast, we like to shower those items with fresh fruit and toasted oat and nut toppings. A platter of juicy fruit hits the spot, especially when it’s added to a rich and savory breakfast menu. Entertaining visiting clients or prospects with global tastes? How about a filling bowl of rice garnished with grilled fish, tangy-salty umeboshi plums, and vegetables? A tender, rich crust is what makes this special. Plus, since quiche comes in different flavors, you can turn to this dish again and again for your breakfast catering menu. Give your team a morning boost with vitamin-packed smoothies. Healthy add-ins like açai berries and flaxseed keep everyone revving to go. If you’re looking for low-maintenance breakfast menu ideas, try granola bars. They’re perfect for those hours-long office trainings. Who says breakfast has to be the same old, same old? Try this North African dish of skillet-poached eggs in a bright, spicy tomato sauce. Stuffed with ham and cheese, savory waffles satisfy salty cravings. 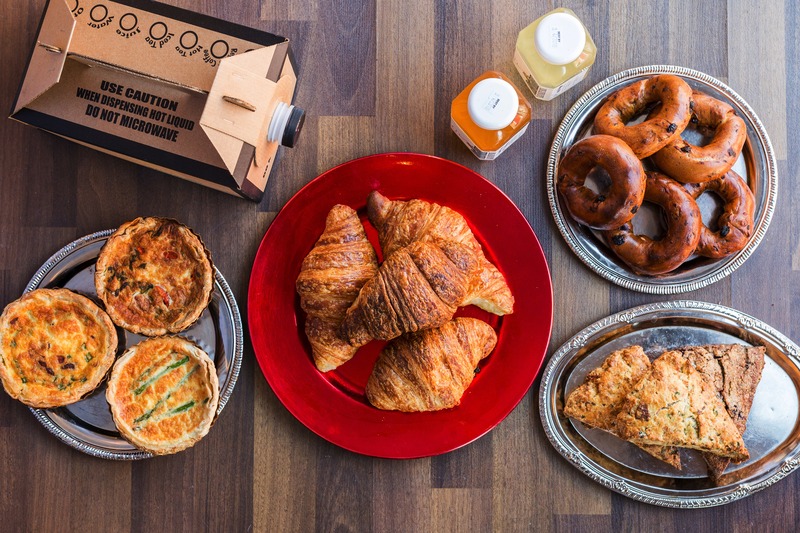 Breakfast boxes might impress your colleagues or clients at the next meeting. They come with either a warm breakfast sandwich or a muffin, as well as fruit and a beverage. Take breakfast a step further with this low-country staple of sausage and shrimp drowning in creamy grits. Hello, caffeine. It’ll perk them right up. Remember to add coffee and non-caffeinated drinks like water and juice to your breakfast menu. Your coworkers and clients will appreciate it. Baked goods make planning a breakfast for fifty so, so easy. This is one of our most popular breakfast menu ideas for accommodating special diets at your office. The breakfast burrito bar offers a bounty of luscious meats, scrambled eggs, veggies, bright sauces, and sides—some of which are vegetarian and gluten-free. These savory pastries keep breakfast interesting and cheap. They’re filled with ingredients like briny olives and honey or spinach, mint, and feta cheese. Know what you want catered? If you want to create a heart-healthy game plan for your office, try this combo: chewy, salty-sweet granola and yogurt. Your colleagues can gather around the table, mingle, and build their own fun creations. Strawberries, whipped cream, uh, marshmallows? This warm salad can be customized to satisfy a range of diets. Try this combo: sautéed kale, roasted peppers, feta cheese, and an egg. Caramelized french toast goes perfectly with crisp bacon, eggs, and fruit. Up your breakfast game with tacos stuffed with spicy sausage, eggs, and extra-crunchy potato hash. This is one of our tastiest breakfast menu ideas for feeding the office. People just might applaud you for it. Ooey-gooey sweet, these rolls are easy to slice—and even easier to clean up. Savory porridge is “it” right now. Chewy, creamy grains get an extra boost of flavor from roasted veggies, cheese, and an egg. Yes, this exists. Melted cheese is fused with delicious breakfast ingredients like sausage. Think your coworkers might want to try breakfast pizza? Get this dish catered for your team. If you’ve got a late-morning team meeting on your hands, try this dish. Golden, craggy fried chicken is stacked on flaky, buttered biscuits. Impress for less with flaky pastries filled with apples, almond paste, or berries. Don’t spend hours ordering catering. The hot breakfast buffet is one of our go-to ideas for building a quick and easy breakfast menu for the office. It typically includes everything your group needs to power up on breakfast, from bacon and eggs to OJ. These portable, light wraps are perfect for clients or prospects on the go. They’re filled with eggs, healthy greens, and other delicious ingredients. These crêpe-like pancakes are thinner than your traditional flapjack, and they’re rolled with sweet toppings, too. Cut into the tender pancakes and you’ll find a warm stash of berries. This is certainly not for everyone, but it’s perfectly suited for those who love the sweet-salty-crunchy combo. Think glazed doughnuts plus fried chicken. Sure, oatmeal is affordable, nutritious, and guilt-free—but it’s also delicious. Especially with a toppings bar of goodies like fresh blackberries and apples, crunchy almonds, and toasted coconut. Sink your teeth into these soft Czech pastries (pronounced ko-LAH-chee). The divot in the center is laden with sweet fillings like strawberries and ricotta cheese. These golden-fried Spanish fritters are filled with ingredients like ham, potatoes, and cheese. They usually cost around $1.25 per piece. Nice, right? Keep your team’s breakfast routine interesting with these toasty sandwiches, loaded with luscious meats, fried eggs, creamy guac, and bright, pickled toppings. 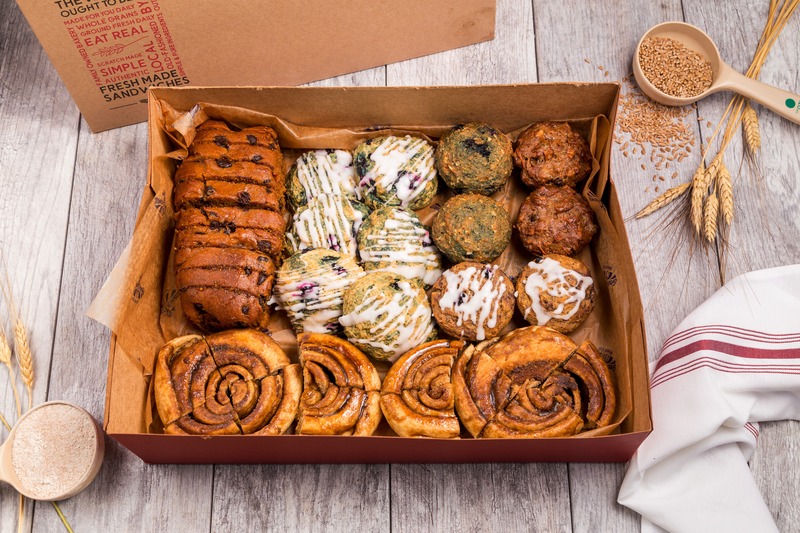 Ordering a box of pastries takes minimal effort. Plus, these flaky, caramelized pastries look so good on the conference table. This crunchy, gooey sandwich is layered with gruyere cheese, ham, and rich béchamel sauce. It’s certainly one of our most indulgent breakfast menu ideas for the office, but don’t knock it till you try it. Order this dish for your next meeting. Make menu planning quick and easy with our list of breakfast ideas for the office. When you’re done tackling breakfast, drink some tea, or maybe a latte, and soak up the day. Ready to order breakfast catering for your team?